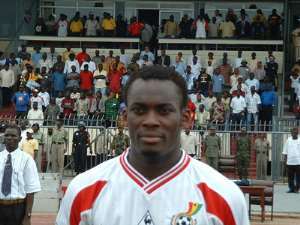 Three more Black Stars players; Samuel Osei Kuffour, Michael Essien and Ibrahim Tanko have pulled out of the Maputo training tour. The trio were granted permission by Ghana coach, Mariano Barreto and the FA management board. Kuffour, Essien and Tanko were expected to join some foreign-based players alongside assistant coach, Silas Tetteh to emplane for Maputo on Wednesday. Black Stars captain, Stephen Appiah pulled out of the trip due to a minor injury he picked during the world cup game against the Bafana Bafana of South Africa on Sunday. Sulley Muntari, Baffour Gyan, Emmanuel Duah, Addoquaye Pappoe, John Mensah, Kwadwo Poku, Kofi Amponsah and Lawrence Aidoo left Accra Wednesday night for Maputo. The players join the rest of the squad who led by coach Mariano Barreto left Accra Monday for the training tour which is expected to help the team polish up ahead of the Uganda game next weekend. However, Kuffour, Essien and Tanko, all who featured in the game against South Africa is expected to feature in the game against the Cranes of Uganda on July 3 in Kampala. The game against the Mambas of Mozambique though is to celebrate the host's independence celebrations forms part of Ghana's preparations ahead of the July 3 world cup qualifying game against Uganda.